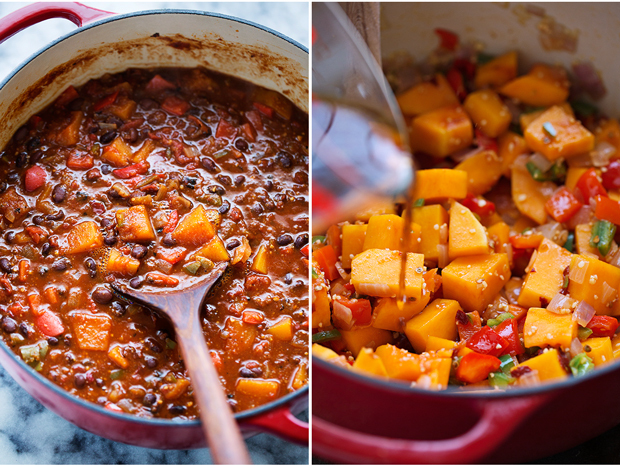 A smokey chipotle butternut squash chili recipe that’s perfect for these crisp fall days! 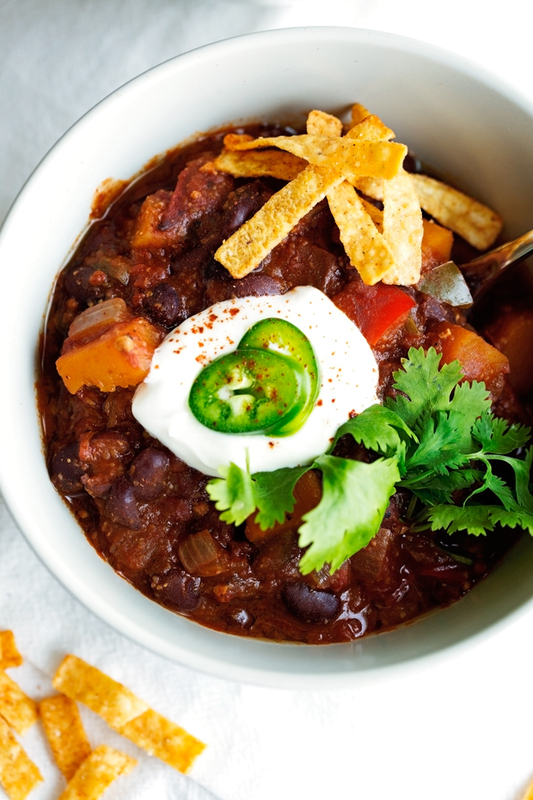 This chili recipe is completely vegan and has tons of butternut squash, peppers, and black beans. Enter: fall comfort food that’s completely vegan and loaded with tons of veggies and lots of my favorite protein — you guessed it, black beans! Have you gotten out your riding boots, sweatshirts, and beanies yet? Okay, don’t wear them all together (but you know what I mean), because it’s CHILI SEASON! I absolutely heart this time of year! It rains a lot in fall in Houston so i’m shopping around for a good pair of rain boots. I want a pair of Hunter Boots but would it be totally weird if I wore them when it didn’t rain? Keep in mind it doesn’t snow in Houston. My teenage sister told me it’s odd. And since she is pretty much my fashion guru, i’m inclined to believe she’s right. Don’t tell her I said that. But first, how was your weekend? Mine was a roller coaster of emotions! All good emotions though, so I really can’t complain. 🙂 I’ve got some exciting news to share with you guys here in the next few weeks which we made major development on this weekend so yeah! That’s all I can say for now. 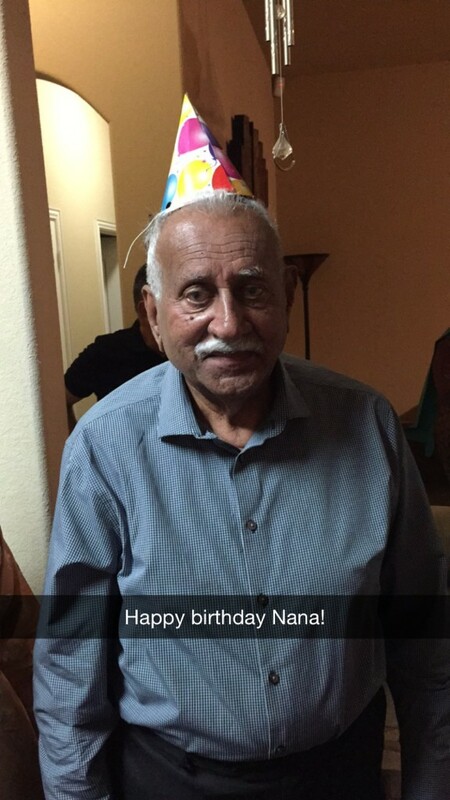 And secondly, we had a surprise 80th birthday party for my grandpa this weekend in Dallas. If you follow me on SNAPCHAT (littlespicejar) you already know! And he was totally surprised. He’s been visiting my aunt in Dallas for the last week or so from Vancouver and was hoping we’d all make the short 4 hour road trip up to see him. We let him think for a whole week that we probably wouldn’t be able to make it this time while he was visiting. It was hard. We’re total bean spillers over here. Needless to say, it was a short but fun-filled weekend. 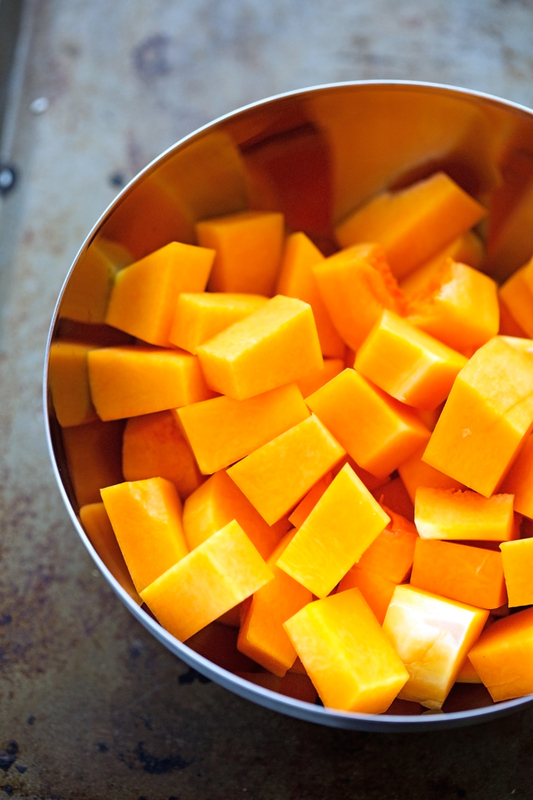 Okay, now on to this butternut squash chili recipe! This one has got it going on! It’s super meaty without the meat of course. Lots of cubed butternut squash, bell peppers, onions, jalapeños, and black beans help made this chili nice and hearty but totally vegan. So let me ask you this, do you have any strange secret chili ingredients? For me it’s definitely a little cocoa powder and ¾ cup of coffee. <– I know how weird it sounds but you have to give it a try! It’s the exact flavor that a warm hearty chili needs but is so hard to replicate especially in a chili recipe that’s completely vegetarian. You absolutely cannot taste the the cocoa or the coffee but man, does it make this chipotle chili so flavorful! Obvi, we’re also using chipotle chili peppers and some adobo sauce too. A couple of jalapeños that are seeded and diced and a bit more of that bright flavor. You can leave them out completely if you want your chili to be mild or just replace them with ½ a green bell pepper. I used a little cornmeal to thicken up my chili to preference, you can add it in or leave it thinner depending on your personal preference. We topped ours with a little bit of sour cream and lots of crushed up tortilla chips and cilantro. Always, always cilantro. Keep in mind, the sour cream will make this otherwise vegan butternut squash chili, unvegan. Heat the olive oil in a 5-quart dutch oven. Add the onions and cook for 4-5 minutes or until the onions just begin to turn translucent. Stir the onions as required to keep them from browning. 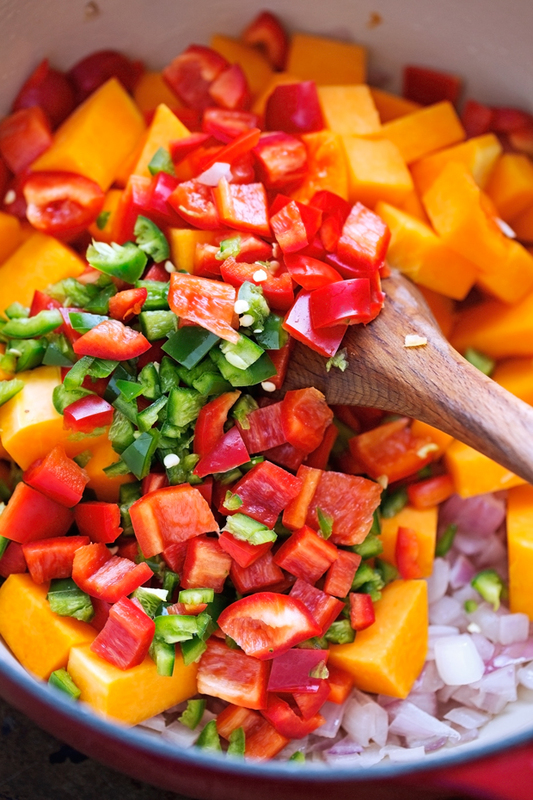 Add the red bell pepper, jalapeños, and butternut squash and continue to cook for another 3-4 minutes. Add the garlic and let cook for just 30 seconds before adding in the coffee, broth, cocoa powder, smoked paprika, chipotle peppers, chili powder, cumin, brown sugar, and tomatoes. Allow the chili to come to simmer before reducing the heat. Cover and let the chili cook for 25-30 minutes on low heat. Taste for spice level and adjust with additional chipotle peppers if desired. Add the black beans and allow the chili to cook for another 30 minutes. The chili is done when the butternut squash is tender and the liquid should reduce a bit. To make your chili heartier, sprinkle in 1 tablespoon of the cornmeal, stir to combine, and allow 5-7 minutes to thicken. You can add the second tablespoon and follow the same directions to thicken it further. 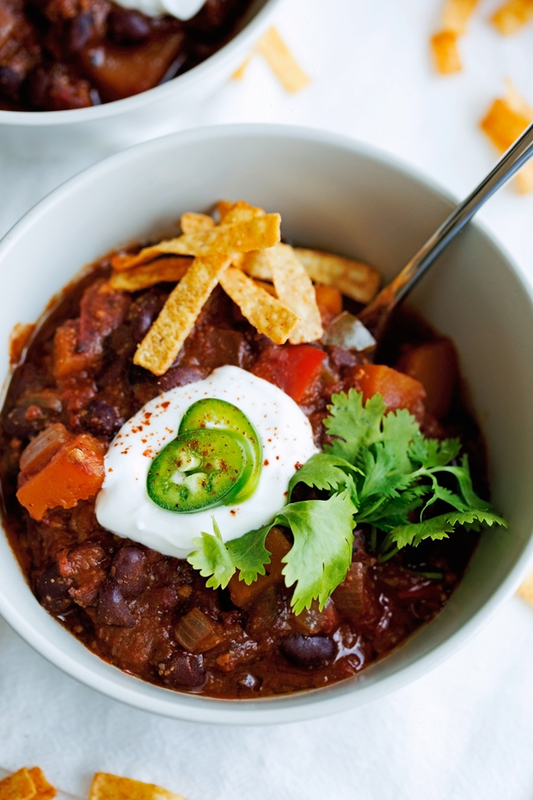 Serve the chili in bowls, topped with crushed tortilla chips and sour cream (if not vegan) or diced avocados. Chopped cilantro and lime wedges are good too. Jalapeno peppers are optional, you can replace them with diced bell peppers for a more mild chili. Chipotle peppers in adobo sauce are sold in the ethnic food aisle.